The existing building is conveniently located in the heart of downtown Anchorage. With the new addition, the total project square footage comes to 64,000 square feet. 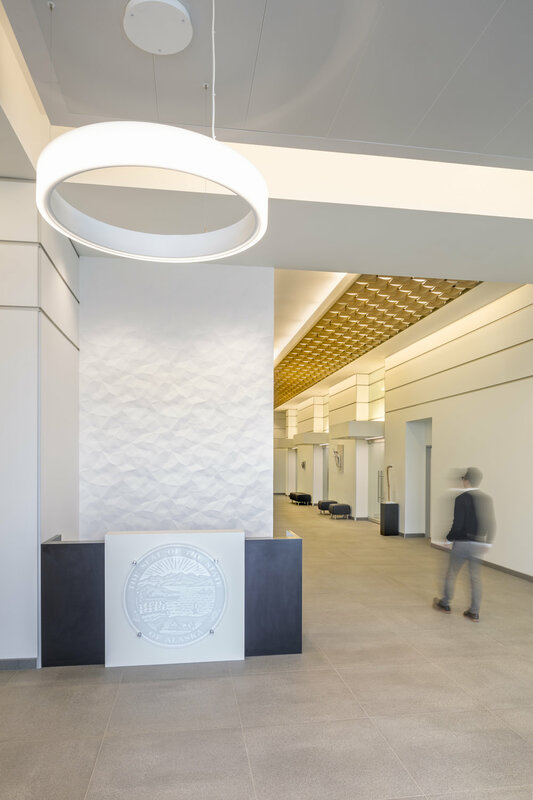 The complete retrofit of the original building includes replacing the original exterior with high performance glass and aluminum, new mechanical and electrical systems and new elevators and restrooms. The entire seismic system has been completely replaced with a state-of-the-art buckling restrained bracing system. The floor plans are designed to provide an efficient layout while providing a standard office suite configuration. Each floor has a shared conference room, copy/break room and a small informal meeting space. The second floor has a large outdoor all- season gathering space. The ground floor includes 14-foot ceilings and a 150 person meeting space with multiple layout options. One additional large meeting room can easily be split into three smaller conference rooms.